On the North Dakota State Capitol grounds in Bismarck, a 12-foot high bronze statue of Sakakawea and her baby son, Jean Baptiste, stands near the Heritage Center - the state's largest museum. 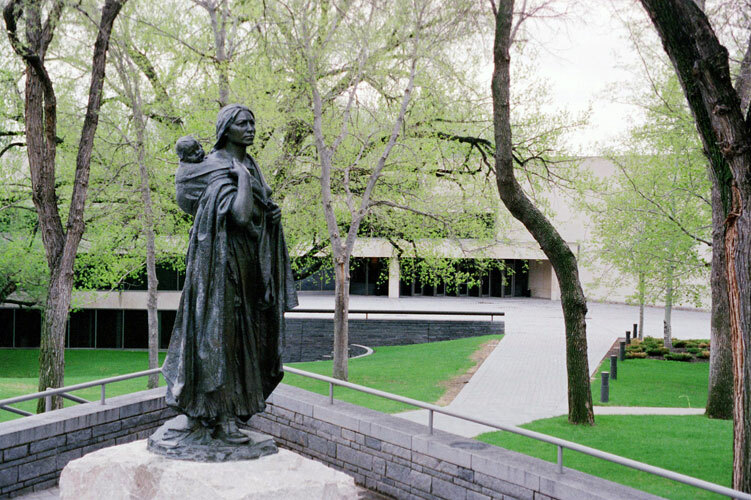 The statue, created by Chicago sculptor Leonard Crunelle, depicts Sakakawea with her baby strapped to her back, looking westward toward the country she helped open on the Corp of Discovery. The story of Sakakawea is fascinating and unique and it can be explored through an online exhibit by the State Historical Society of North Dakota. A special piece of that story surrounds newborn baby Jean Baptiste Charbonneau. Today, February 11, marks the 214th birthday of Baptiste. In the book "A Vast and Open Plain" edited by North Dakota's own Clay Jenkinson, we find how Captain Meriwether Lewis documented the birth. "about five oclock this evening one of the wives of Charbono was delivered of a fine boy. it is worthy of remark that this was the first child which this woman had boarn and as is common in such cases her labour was tedious and the pain violent; Mr. Jessome informed me that he had freequently administered a small portion of the rattle of a rattle-snake, which he assured me had never failed to produce the desired effect, that of hastening the birth of the child; having the rattle of a snake by me I gave it to him and he administered two rings of it to the woman broken in small pieces with the fingers and added to a small quantity of water. Whether this medicine was truly the cause or not I shall not undertake to determine, but I was informed that she had not taken it more than ten minutes before she brought forth"
It is not fully known if Baptiste (also nicknamed Pomp or Pompy by Lieutenant William Clark) was born at Fort Mandan, or nearby. He remains the only infant to be a part of a major exploration and to ever be depicted on United States currency. More about Sakakawea's son is also online with the "Creating Sakakawea" exhibit. Visitors to North Dakota can learn more about Sakakawea, Baptiste, the Corp of Discovery and the Mandan and Hidatsa peoples along the Lewis & Clark Trail in North Dakota and notably at the Heritage Center, the Lewis & Clark Interpretive Center and Fort Mandan, and numerous Trail attractions. A replica of the Sakakawea statue is also on display at the U.S. Capitol.